President Bush’s pick to fill a top enforcement job with the U.S. Environmental Protection Agency has withdrawn his name from consideration. Donald Schregardus faced tough criticism from environmentalists and democratic senators for his record while he was director of the Ohio EPA. The Great Lakes Radio Consortium’s Natalie Walston reports. In withdrawing his name from consideration, Donald Schregardus wrote to President Bush that it’s clear the U.S. Senate won’t consider his nomination in a timely manner. Democratic senators Barbara Boxer of California and Chuck Schumer of New York delayed a senate vote on his nomination. The senators and environmentalists say Schregardus failed to enforce clean air and clean water laws while he was head of the Ohio EPA from 1991 to 1999. Schregardus defended his record in the letter to Bush. He says because of his leadership, Ohio is cleaner, and regulatory programs are stronger. An Ontario company has developed a way for farmers to turn their vegetable waste into heating fuel. The Great Lakes Radio Consortium’s Karen Kelly reports. Southern Ontario is home to some of the largest greenhouses in North America. And they produce several tons of vegetable scraps every week. Most of it ends up in landfills, where it decomposes and produces heat that escapes into the atmosphere. But engineers at Acrolab in Windsor, Ontario say they’ve found a way to capture that heat without using other energy sources. Acrolab makes copper heating pipes that are filled with fluid. When one part of the pipe is heated, the fluid instantly transfers the heat throughout the whole thing. Engineers placed these pipes in compost piles and then extended them into a test greenhouse. The pipes heated the greenhouse for five months. The company is now starting pilot projects in three different sized farm buildings. They say it’s too early to estimate the cost. But they expect farmers will reduce their energy bills by 40 to 60 percent. For the Great Lakes Radio Consortium, I’m Karen Kelly. Small-scale on-site power generation technologies help protect the environment. Will they also help to protect us against terrorism? Our commentator Byron Kennard argues that they do. Like every American, I am mourning the tragic losses that terrorists have inflicted on our nation. But I mourn too because I fear that in the aftermath of these attacks, environmental protection efforts will be sacrificed to the awful necessities of war. I am reminded of a remark Tolstoy once made to a young friend, “You may not be interested in war,” Tolstoy warned,” but war is interested in you.” War’s interest in the young is fully matched by its interest in the environment. Economic development will be hard to achieve and will take much time. But in it environmentalists can find some solace. There are environmental ways to develop economies and often these make the most sense for the world’s poor. For example, two billion people in the world have no access to electricity. Providing them electricity for lighting, clean water, refrigeration and health care, and radio and television is perhaps the best single way “to drain the swamps.” The best way to make electricity available to the world’s poor is through on-site generating technologies that are the environment friendly. These “micro power” devices generate electric power on a small scale close to where it is actually used. They include fuel cells, photovoltaics, micro generators, small wind turbines, and modular biomass systems. For instance, a micro generator the size of a refrigerator can generate 25 kilowatts of electricity, enough to power a village in the developing world. The environmental approach toward energy sufficiency in developing nations has been to utilize micro credit. That means providing poor people with affordable mini-loans to purchase on-site energy generators, or micro generation. Currently the US leads the world in exporting solar electric, small wind, fuel cells, and modular biomass systems to the developing world. Such exports of energy generation have become a $5 billion per year market, so this environmentally benign strategy is also economically productive. In short, electrifying the poor regions of the world will benefit our people, our planet and the cause of peace. An Ohio jury has awarded neighbors of a large factory farm 19.7 million dollars in damages. People living near Buckeye Egg Farm in Central Ohio have complained for years of fly infestations and odors. The outcome of the lawsuit may or may not affect similar cases in other states. The Great Lakes Radio Consortium’s Natalie Walston reports. Freda Douthitt’s house sits at the end of a gravel lane. The driveway is surrounded by trees and wild flowers. She’s always liked it here because it’s secluded … she’s a couple miles from a rural road. She likes to sit on the multi-tiered back patio that overlooks a small pond. That’s where she grades composition papers from her Freshman English class at Ohio University. But she has also had to swat at flies for the past ten years. Douthitt collects flies in a container that is nearly the size of a gallon milk jug. She estimates this one has about 2-3 inches worth of decomposing flies and maggots collected since August 22. “It smells out here. That’s the flytrap. That keeps some of them from getting in the house. Today there’s a few flies out here. There are days when that wall would be just polka dotted with them. Douthitt has frozen the containers of flies and collected them over the years. She took them to court with her to prove the problems she deals with living near a factory farm. That’s what helped her win a 1.2 million dollar share of a settlement with Buckeye Egg Farm. It’s one of the world’s largest egg-laying producers. Douthitt’s house is three-quarters of a mile from one of the company’s egg-laying plants. The flies come from the vast amounts of manure produced by millions of chickens housed at the company’s barns. The manure gets spread on farm fields that surround Douthitt’s house after harvest season in the fall. Since then … she has watched as run-off from Buckeye Egg properties killed tens-of-thousands of fish in a nearby creek. She has even seen the creek water turn purple. She says she never expected to win in court against the company when she began the legal battle 9 years ago. “I never thought about suing. Until one of the neighbors I’d been working hard with trying to get the EPA to do something … trying to get the county health department interested … um, we were both frustrated at that point. She called up one evening and said we’re ready to call a lawyer, are you? And I said, yeah, I’ll meet with you. Douthitt and 20 of her neighbors won a 19.7 million dollar lawsuit against Buckeye Egg. This win has other people in Great Lakes states hopeful they too can win in court against large factory farms. Julie Janson of Olivia, Minnesota knows Douthitt’s story all too well. Janson has been fighting hog factory farm owner Valadco for 6 years. Her house sits sandwiched between two of the company’s hog barns. Janson and her husband filed a lawsuit this spring against the company. They are asking for close to 200-thousand dollars because Janson says her family of eight gets sick from manure odors. Janson says she took her 11-year-old daughter to a specialist in California to prove she has brain damage from smelling hydrogen sulfide. Decomposing manure creates hydrogen sulfide gas and ammonia that smells like rotten eggs. Janson says her family has spent one hundred thousand dollars to fight Valadco. She had to close her daycare center, which she ran from her home, partly because of the stench. Her husband is supporting the family with his truck-driving job that brings in nearly 38-thousand dollars a year. She says a win over Buckeye Egg farm in Ohio is a victory that can help her cause. Both Janson and Douthitt say it’s not the money that will make them happy. Douthitt says she will probably never see the money that she is owed. But … she says the county judge may force the company to clean up its farms and the surrounding communities. Buckeye egg farm officials have said they may appeal the verdict. The company says it has already spent millions of dollars to try and clean up its facilities. Earlier this year, Buckeye Egg settled a multi-million dollar lawsuit with Ohio’s attorney general’s office. The state sued the company for dumping dead chickens in a field and polluting creeks by spilling contaminated water. The state has since filed seven sets of contempt charges against Buckeye Egg for not correcting the problems. It’s still undecided whether Buckeye Egg will file for bankruptcy following the verdict. Prices spiked at some gas stations around the region after September 11th, and many drivers felt compelled to wait in long lines to fill their tanks. Despite the patriotic fervor that has marched across the country, the first test of the war against terrorism found many Americans taking a “me first” attitude. When rumors were flying that gasoline shipments might be disrupted, people lined up to fill their tanks before supplies dried up. The Great Lakes Radio Consortium’s Lester Graham reports. 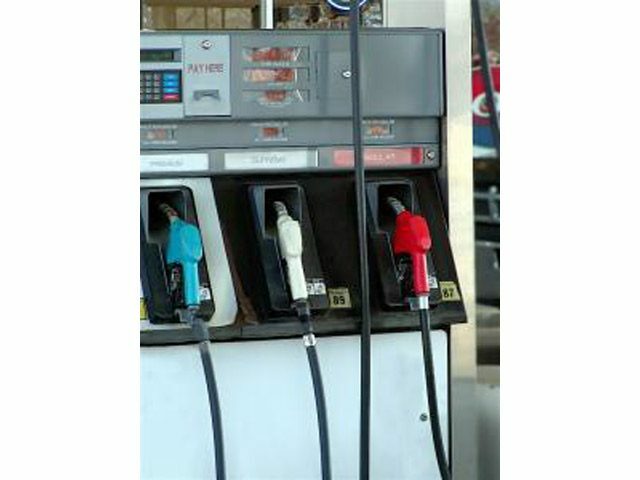 On September tenth, the Energy Department reported that gasoline prices fell almost two cents per gallon. It was the first drop since early August and nearly three-and-a-half cents a gallon cheaper than the same time last year. Supplies of gasoline were plentiful and cheaper, but no one seemed to be in a particular hurry to filler up. That all changed on September eleventh. As the terrorist attacks in New York and Washington D-C unfolded rumors of refineries shutting down started circulating. Some suppliers told service station retailers that they weren’t sure when or even if they could deliver the next shipment. Word quickly spread that the price at the pumps was going up. Sharon Cameron lives and works in a small town in Illinois. She heard from a co-worker that the price might go up to five dollars a gallon. When she got near the convenience store. She found a long line of cars and trucks. And some in line weren’t happy about what they saw in front of them. People appeared to be hoarding gasoline because of rumors that speculated supplies would be cut off because of the terrorist attacks. Some retailers took advantage of the situation. Scott Mulford is a spokesperson for the Illinois Attorney General’s office. He says about 1500 people from around the state called in complaints that stations were price gouging. The Illinois Attorney General is filing suit against one convenience store chain, charging that the price spikes violated the state’s Consumer Fraud and Deceptive Business Practices Act. Other states in the Midwest had similar incidents. Ohio is filing suit against at least four station owners. There were reports of price gouging in Wisconsin. The Michigan Attorney General has plans to file suit against 13 retailers. Some retailers say in their defense that it wasn’t greed that motivated them. But concern about gas supplies. Some of those gas station owners who hiked prices on September eleventh say they were simply trying to discourage a mad rush for gasoline by raising the price. Stanley Pruss is with the Michigan AG’s office. Pruss says it’s somewhat understandable that people wanted to rush to fill their tanks when they heard that gas prices were going up to five-dollars-a-gallon or that supplies might be disrupted. Wansink says part of this tendency is a leftover from another national crisis, the depression. He says our parents and grandparents who lived through the Great Depression in the 1930’s have instilled in us the stories of their terrible struggles. So, storing up or hoarding is part of our culture. At least this time the impulse to hoard gasoline was short-lived. The lines dwindled in just a few hours. Hiked prices were lowered to more reasonable levels by the next day. Hoarding quickly gave way to an outpouring of generosity toward relief efforts for the victims of the terrorist attacks. It’s evident that Americans have another tendency: that is, to pull together in times of tragedy. After they’ve had a little time to reflect on the bigger picture. Mourning Dove Protected as Peace Symbol? In Wisconsin, a record number of hunters turned out at public meetings last year and voted for a shooting season on mourning doves. The season was supposed to start this September, but a judge has issued a temporary injunction against the hunt. He’s ruled that during the Vietnam War era, Wisconsin lawmakers may have taken the mourning dove off the list of regulated game birds, when they made the dove Wisconsin’s official symbol of peace. But Jim Weix of the Wisconsin Dove Hunters Association, says this year, lawmakers reversed themselves and checked over a proposed rule allowing the dove hunt. A final court ruling is not expected prior to October 30th, which is when this year’s mourning dove hunt was scheduled to end. For the Great Lakes Radio Consortium, I’m Chuck Quirmbach in Milwaukee. The U-S Coast Guard is increasing patrols, and closely monitoring every ship that is navigating the Great Lakes. It is also adding patrols to the St. Lawrence Seaway and the St. Mary’s River. There are no specific new regulations in place, but the Coast Guard is evaluating each vessel on a case-by-case basis. The Guard also has the authority to restrict any movement or remove ships from ports. The Coast Guard is also increasing security at its own ports, and has restricted access to all Coast Guard Buildings and vessels. The Secretary of Transportation gave the increased authority to the Coast Guard shortly after the attacks. There is no timetable for how long the heightened security measures will be in place. For the Great Lakes Radio Consortium, I’m Jonathan Ahl. The terrible events in New York City and Washington D.C. have left a legacy of personal tragedies. For Great Lakes Radio Consortium commentator, Suzanne Elston, the story of September 11th, began as a journey of peace. I’ve never been to New York City. So when we got an invitation to visit the Big Apple and participate in a children’s peace festival, we jumped at the chance. My husband Brian and two of our kids, Peter and Sarah, were going to be part of a church service marking the opening of the 56th session of the United Nations General Assembly. Sarah was going to carry the Canadian flag and Peter was going to give a reading. The kids were wired and so were we. Our plan was to leave Toronto Tuesday morning by train. The daylong trip would take us to New York City. We’d have all day Wednesday to do touristy things before the service on Thursday. We’d even managed to get tickets to a Broadway play. It all sounded so exciting that I couldn’t believe that it was actually going to happen. We’d been on the train for about an hour when we first heard the news. Our traveling companions were 18 members of the Toronto Children’s Peace Theatre, also en route to the peace festival. The director of the company received a cell phone call that gave us sketchy details of the initial attack on the World Trade Center. At first I refused to believe it. Here we were heading for an international children’s peace festival. It felt like we were on the voyage of the damned. We continued on our journey, barreling down the tracks to a destination that we knew we would never reach. We heard rumors – the border was closed, there was shooting in the streets. People with cell phones were frantically trying to get a hold of somebody they knew who could give us an update. The children from the theatre group were particularly upset. For most of them it was their first time away from home, and they were scared. As we discussed the latest details that we’d heard, one of the kids started to throw-up. We moved to another car and tried to explain to a group of university students from England that they wouldn’t be flying home the next day from New York. As the news continued to filter in, we soon realized that they wouldn’t be flying home from anywhere. An elderly couple at the back of the car sat in stony silence. Their daughter worked at the World Trade Center and they were frozen in fear. The conductor was stuck like a moose in headlights. Most of the passengers still didn’t know what was going on. My husband finally took him aside and explained that he had to make an announcement. People needed to make arrangements, to talk to their families. But he was just a kid and as scared as the rest of us. He wanted to wait until he had something official from Amtrak’s head office. Finally, at 11:00 a.m., he made a formal announcement. The border was closed and we all would be disembarking at Niagara Falls. It was Tuesday evening by the time we got home and saw the horrific images of what had happened. It wasn’t until then, when we were safe and home and together that we had a shocking revelation. The first stop on our sightseeing trip was going to be the World Trade Center. For the sake of a mere 24 hours we could have been buried at the bottom of that rubble like so many others. Our great journey of peace ended with many prayers. We prayed for the victims and their families, we prayed for peace. Finally, we gave a prayer of thanks that we’d all made it home safely. After witnessing Tuesday’s horror – that was a gift beyond measure. Terrorism prevention experts who’ve been calling for better security at vulnerable targets now have the public’s attention. The Great Lakes Radio Consortium’s Lester Graham reports. The experts say although a determined attack by a terrorist probably cannot be stopped. Security measures can be taken that would cause them to look for an easier target. Jim Snyder at the University of Michigan has co-authorized reports on water protection for the defense department. He says natural resources such as community water supplies and forests can and should be better protected. Snyder and other terrorism protection experts urge local governments to assess their risks and secure vulnerable areas. For the Great Lakes Radio Consortium, this is Lester Graham.